Development effort focused on open access, IT manageability, and security and compliance. In his recent No Jitter post, "Why Teams Is the Future of Skype for Business," UC consultant Kevin Kieller counted federation and guest access as one of the four reasons why Microsoft needs to combine the features and functionality of its disparate cloud UC and team collaboration tools, Skype for Business and Teams. As he explained, "Teams neither supports the powerful and proven federation model of Skype for Business, even between organizations both using Office 365, nor provides the same sort of robust guest access to meetings. In fact, Teams provides no guest access, only allowing users within your organization to join a team. Enhancing federation and guest access for Teams is mandatory." From his lips to God's ears... as revealed yesterday in an Office blog, Microsoft now offers guest access to Office 365 commercial and education customers. As long as a potential guest has an Azure Active Directory (Azure AD) account, any Office 365 user can add him or her to a Teams workspace, in use at more than 125,000 organizations worldwide, Wright reported. 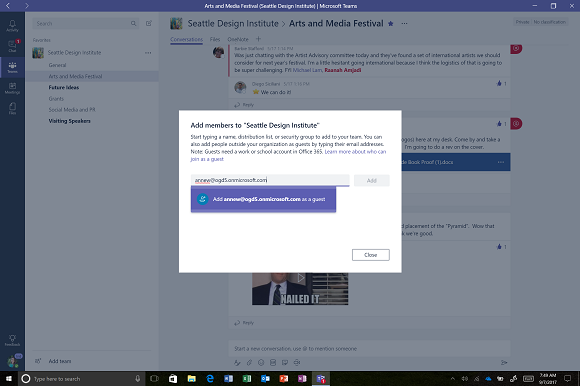 At an unspecified later date, it will let Teams add anybody with a Microsoft Account (MSA) as a guest, wrote Lori Wright, GM for Microsoft Teams. Guests who don't have an MSA will be prompted to create a free account using a corporate or consumer email (Outlook or otherwise). But as Kieller pointed out in that earlier No Jitter post, letting users extend invites to any email user isn't the end of the story. The challenge in opening guest access to persistent team collaboration spaces is in making it manageable, he said. "The Skype for Business federation model does this very well," he wrote, "providing controls at both the organization and individual levels along with the ability to monitor and report on external access." Indeed, enabling IT management was another principle goal for Teams guest access, Wright wrote. IT can centrally manage how guests participate within an organization's Office 365 environment, with admins having the ability to view, add, or revoke a guest's access to the host tenant," she wrote. And, for security and compliance, IT will add and manage guest accounts within Azure AD and through Azure AD B2B Collaboration, Wright continued. This means IT can set conditional access policies for guest users, as well as apply the same compliance and auditing protections to guest user content and activities as the rest of Office 365. While guest access is a must, Kieller told me he isn't entirely sold on this effort. For one, he said, it's not clear that guest access is available for many tenants. And, two, he's heard from users who have previously tested the functionality that it's unreliable. "The proof will be in the pudding," he said. While guest access smooths the user experience, Microsoft also is making Teams easier to work with for developers. In a separate post, the Microsoft Team announced that popular bot-making toolkit Botkit now supports Teams, and gave a heads-up that integrations from Atlassian and ServiceNow are in the works. These developments are "welcomed, but expected," Kieller noted, "especially as Microsoft positions Teams as a collaboration platform."